Wayne Rooney broke Bobby Charlton's Man United goalscoring record at the weekend. 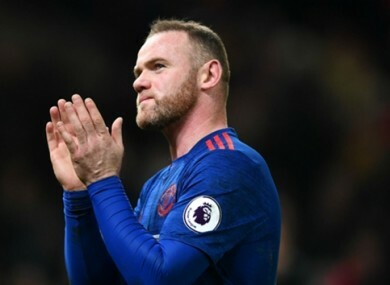 ZLATAN IBRAHIMOVIC FEELS Wayne Rooney is not appreciated enough in English football, despite being the leading goalscorer for club and country. The Manchester United striker edged ahead of Sir Bobby Charlton’s all-time haul at Old Trafford on Saturday as he grabbed a late leveller in a 1-1 draw at Stoke City. He now has 250 goals for the Red Devils, while Charlton saw his England record broken in September 2015 — with Rooney now on 53 for the Three Lions. Ibrahimovic, though, feels Rooney still does not get the respect his achievements deserve, with the Swede struggling to see why he is no heralded as a national treasure. “He’s a complete player,” said United’s frontman. “Off the field he’s a real leader and on the field he’s just complete. He helps his team-mates well and has that big quality – he knows how to score goals, knows how to assist. “But he works very hard, he’s got a good attitude and spirit. Everybody knows what Wayne is. But this country has to appreciate him. Ibrahimovic believes greater attention needs to be paid to who Rooney has beaten in collecting two record goal hauls, with some legendary figures from United’s past now living in his shadow. He’s the top scorer of the club and I’m very happy for him. “It’s a big thing you know – many great players have been here and his name is right on top. Email “'This country has to appreciate him' - Ibrahimovic bemused by lack of Rooney respect”. Feedback on “'This country has to appreciate him' - Ibrahimovic bemused by lack of Rooney respect”.